So, another week has passed - not nearly as many films to report on as last week, largely due to me purchasing LA Noire for the Xbox and getting absorbed in a world of '40s Hollywood intrigue. Still, all 3 of the films I did see this week were very good. Sam Raimi's feature film debut, this is a story of a group of college friends who head into the woods for a relaxing weekend in an old wooden cabin. Unfortunately, it appears that the previous occupant of the cabin was a professor with an interest in the occult, and when one of the students plays an tape of the professor reading aloud incantations from the 'Book of the Dead', all hell breaks loose as evil spirits begin to possess the group. Pretty soon, only one man is left standing - Ash (played by Bruce Campbell). Will he be able to get through to dawn before he too is taken by the dark forces lurking in the forest. Considering the very low budget which Raimi had to work with, The Evil Dead is a remarkable success - the special effects are equally inventive and repulsive, and as well as being frequently scary, it is also very funny - chiefly due to the sheer amount of gore on display. The acting is a little weak at times (all of the cast were non-professional actors), but that doesn't get in the way of a terrific take on the zombie movie. This is actually the final part of the Evil Dead trilogy which I've seen (I started with Part and moved on to Army of Darkness before getting round to the original) - but I've got to say that this is probably my favourite movie of the three. Another movie which expertly manages to mix up horror and comedy, this is well worth a watch. One minor irritation to report though (nothing to do with the movie itself, mind) - when are they going to change that bloody Orange Rio tie in commercial? I must have seen it about 20 times now, and it wasn't funny the first time. Now it's just excrutiating. I've enjoyed a few of the Orange ads in the past, but this one is well past it's sell by date, particularly as Rio has been out for over a month. I'm just hoping they'll have changed it by the next time I go to the cinema. Anyway, like Evil Dead, Attack the Block manages to get laughs and scares on a limited budget. The aliens aren't exactly terrifying in themselves, but Cornish gets a lot of mileage out of jumpy moments where they suddenly appear from off screen to mangle an unsuspecting victim. Possibly the biggest point in this film's favour is the way that you go from strongly disliking the central characters (who begin the movie by mugging a nurse outside a South London council estate) to empathising with them. They aren't bad kids essentially, they're just products of their environment, and over the course of the film they learn that negative actions are likely to lead to unpleasant consequences. The script is funny, in a low key sort of way, throughout the film, and there are particularly funny turns from Nick Frost as a low level drug dealer, and Luke Treadaway as a stoned rich kid who has the misfortune to be in the wrong place at the wrong time. 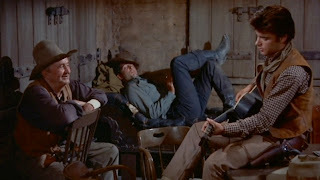 A classic Western with John Wayne, Dean Martin and Angie Dickinson. A sheriff in a small Texan town in the Old West tries to guard the brother of a rich ranch owner who is wanted by the US Marshal for murder - and is helped by a ragtag group of town outcasts, including a drunk, an old man with a limp, a fast talking female card sharp and a quick on the draw youngster. I've never usually been particularly fond of the Western genre - I've liked a few of the more recent ones which I've seen (3.10 to Yuma, Unforgiven, Tombstone, Open Range), but there are a large number of classic Westerns which I haven't got round to seeing yet. Anyway, after a writer at the Onion AV Club strongly recommended Rio Bravo, I thought I'd give it a go. I enjoyed it well enough, but was never really blown away by it. There were some well staged shootouts, a good old fashioned singsong, and Martin and Wayne are both charismatic performers.